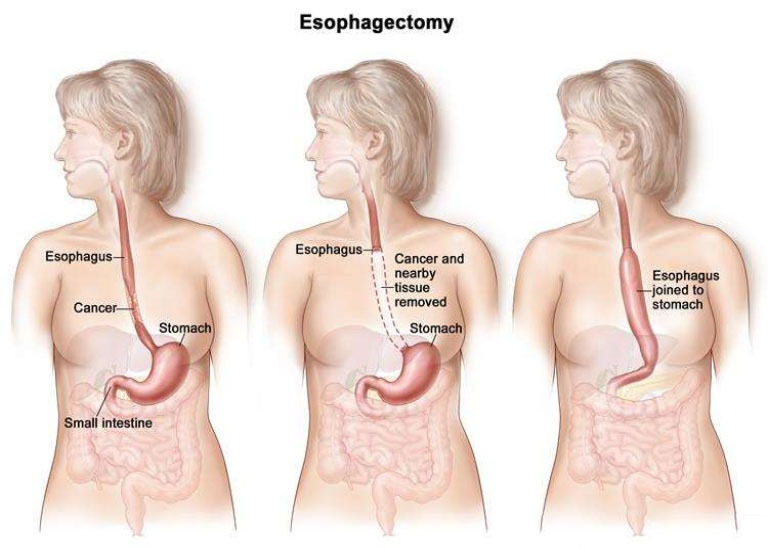 Surgery to remove some or most of the esophagus is called an esophagectomy. Often a small part of the stomach is removed as well. The upper part of the esophagus is then connected to the remaining part of the stomach. Part of the stomach is pulled up into the chest or neck to become the new esophagus. For some earlier stage cancers, surgery can be used to try to remove the cancer and some of the normal surrounding tissue. In some cases, it might be combined with other treatments, such as chemotherapy and/or radiation therapy. • If the cancer is in the lower part of the esophagus (near the stomach) or at the place where the esophagus and stomach meet (the gastroesophageal or GE junction), the surgeon will remove part of the stomach, the part of the esophagus containing the cancer, and about 3 to 4 inches (about 7.6 to 10 cm) of normal esophagus above this. Then the stomach is connected to what is left of the esophagus either high in the chest or in the neck. • If the tumor is in the upper or middle part of the esophagus, most of the esophagus will need to be removed to be sure to get enough tissue above the cancer. The stomach will then be brought up and connected to the esophagus in the neck. If for some reason the stomach can’t be pulled up to attach it to the remaining part of the esophagus, the surgeon may use a piece of the intestine to bridge the gap between the two. When a piece of intestine is used, it must be moved without damaging its blood vessels. If the vessels are damaged, not enough blood will get to that piece of intestine, and the tissue will die. Open esophagectomy: In the standard, open technique, the surgeon operates through one or more large incisions (cuts) in the neck, chest, or abdomen (belly). Many different approaches can be used to remove part of the esophagus. • For a transthoracic esophagectomy, the esophagus is removed with the main incisions in the abdomen and the chest. • If the main incisions are in the abdomen and neck, it is called a transhiatal esophagectomy. • Some procedures are done through incisions in the neck, chest, and abdomen. 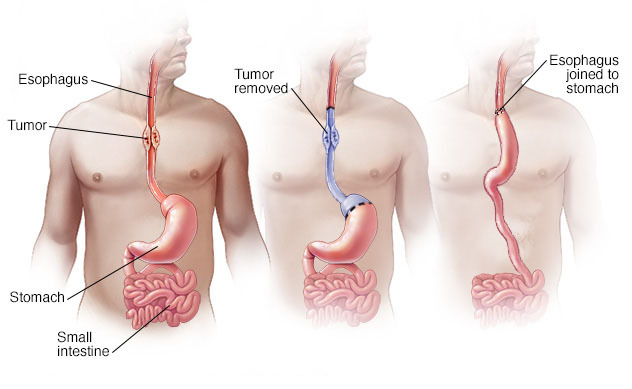 Minimally Invasive Esophagectomy: For some early (small) cancers, the esophagus can be removed through several small incisions instead of large incisions. The surgeon puts a scope (like a tiny telescope) through one of the incisions to see everything during the operation. Then the surgical instruments go in through other small incisions. To do this type of procedure well, the surgeon needs to be highly skilled and have a great deal of experience removing the esophagus this way. Because it uses smaller incisions, minimally invasive esophagectomy may allow the patient to leave the hospital sooner and recover faster. No matter which approach is used, esophagectomy is not a simple operation, and it may require a long hospital stay. It is very important to have it done at a center that has a lot of experience treating these cancers and performing these procedures. If the cancer has not yet spread far beyond the esophagus, removing the esophagus (and nearby lymph nodes) may cure the cancer. Unfortunately, most esophageal cancers are not found early enough for doctors to cure them with surgery. Like most serious operations, surgery of the esophagus has some risks. • Short-term risks include reactions to anesthesia, excess bleeding, blood clots in the lungs or elsewhere, and infections. Most people will have at least some pain after the operation, which can usually be helped with pain medicines. • Lung complications are common. Pneumonia may develop, leading to a longer hospital stay, and sometimes even death. • Some people might have voice changes after the surgery. • There may be a leak at the place where the stomach (or intestine) is connected to the esophagus, which might require another operation to fix. This is not as common as it used to be because of improvements in surgical techniques. 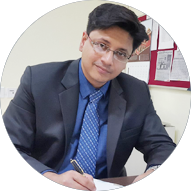 • Strictures (narrowing) can form where the esophagus is surgically connected to the stomach, which can cause problems swallowing for some patients. To relieve this symptom, these strictures can be expanded during an upper endoscopy procedure. • After surgery, the stomach may empty too slowly because the nerves that control its contractions can be affected by surgery. This can sometimes lead to frequent nausea and vomiting. • After surgery, bile and stomach contents can back up into the esophagus because the ring-shaped muscle that normally controls this (the lower esophageal sphincter) is often removed or changed by the surgery. This can cause symptoms such as heartburn. Sometimes antacids or motility drugs can help relieve these symptoms. Some complications from this surgery can be life threatening. The risk of dying from this operation is related to the doctor’s experience with these procedures. In general, the best outcomes are achieved with surgeons and hospitals that have the most experience. This is why patients should ask the surgeon about his or her experience: how often they operate on the esophagus, how many times they have done this procedure, and what percentage of their patients have died after this surgery. The hospital where the surgery is done is also important, and any hospital that you consider should be willing to show you their survival statistics.